Since the birth of cinema, true stories have played an integral part in filmmaking. What better way to jump start an on-screen tale than by staring with a real-life occurrence? This trend continues to this day. In recent years, Disney hasn't shied away from movies which are based on actual events, especially when it comes to their sports-related movies. Even though entries like Million Dollar Arm or McFarland, USA didn't light up the box office, they certainly won't slow down Disney's drive to produce these films. They occasionally steer outside of the sports realm and deliver true stories from other walks of life, such as the maritime adventure The Finest Hours. It's Winter, 1952, off of the coast of Massachusetts. While traveling through a storm, an oil tanker called Pendleton is hit by a massive wave, which creates a leak in the engine room. While engineer Ray Sybert (Casey Affleck) attempts to deal with this, he learns that his ship has suffered an even worse fate -- it has been sheered in half and the back section is now adrift. Meanwhile, on the mainland, Bernie Webber (Chris Pine), a member of the Coast Guard, is trying to get up the courage to tell his commanding officer, Daniel Cluff (Eric Bana), that he is getting married, when a distress calls comes in. Two tankers have been cut in two, one of which is the Pendleton. Cluff orders Webber, along with Richard Livesey (Ben Foster), Andy Fitzgerald (Kyle Gallner), and visiting seamen, Ervin Maske (John Magaro), to take a small craft out into the stormy waters to see if they can help the Pendleton. The task is incredibly dangerous, but Webber always follows orders, much to the chagrin of his fiancee, Miriam (Holliday Grainger). But, will they be able to reach the Pendleton in time? At first glance, it's very easy to see why someone would want to make a movie from the story behind The Finest Hours. First of all, when was the last time that you saw a movie about the Coast Guard? So, this should be a relatively fresh subject. The event is regarded as one of the greatest rescues in Coast Guard history, and as it's a presumably little-known story, it deserves to be told. In addition to that, it deals with an oil-tanker which has been sheered in two. This sounds like something which would come out of a fictional disaster movie, so nothing that it happened to two boats in one night, is fascinating. Blame should go to Director Craig Gillespie, and not just for the questionable editing choices. There is a distinct lack of tension in this film. This should have been a suspense filled adventure, as we wait to see if the men aboard the Pendleton will be rescued, but it simply isn't. Some of this has to do with the naval jargon which is thrown around in the film, but never fully explained to the audience. A big deal is made about the fact that Bernie and his crew will probably never reach their destination because they can't get past "the bar". But, we are never told exactly what "the bar" is, so this talk means little to us. (The bar exam?) When they finally reach "the bar" and begin fighting the waves, we know that this is supposed to be fraught with suspense, but it's not. Also, little is done to tell us why the Pendleton is still afloat or how they know where shallow water is. I'm not saying that the bulk of The Finest Hours was lost on me, but you can take a moment -- in a movie which already feels too long -- and explain some things to the viewer. I'm probably painting a picture of The Finest Hours as being a bad movie, but it's not. It's simply another ho-hum true story which tells us what happened, but fails to bring home any of the emotion which was presumably involved in the incident. The finale is somewhat touching, but otherwise this movie is just as cold as the water in which it is taking place. Clearly audiences didn't see much promise in the film, as it bombed at the box office and reportedly resulted in a $75 million loss for Disney. It's certainly not that bad, and it's worth a rental if you are interested in seeing the Coast Guard at work. Just don't expect to be thrilled or moved. 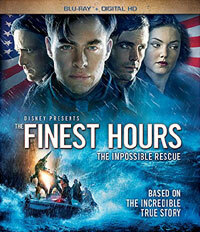 The Finest Hours gets water-logged on Blu-ray Disc courtesy of Walt Disney Studios Home Entertainment. The film has been letterboxed at 2.35:1 and the Disc contains an AVC 1080p HD transfer which runs at an average of 31 Mbps. The image is very sharp and clear, showing no overt grain and no defects from the source materials. The film vacillates from the white snowy landscapes to the dark ocean, but the image is never overly dark or bright, and the colors look fine. The image shows a nice amount of depth, most notably in the landscape shots and the level of detail is good. The Disc carries a DTS-HD Master Audio 7.1 track which runs at 48 kHz and an average of 5.8 Mbps. The track provides clear dialogue and sound effects. The scenes on the ocean provide impressive stereo, surround, and subwoofer effects. The audio effects in these scenes really place us in the middle of the action and give the movie real presence. The Finest Hours Blu-ray Disc contains several extra features. "Against All Odds: The Bernie Webber Story" (14 minutes) is a mini-documentary which gives details about the real-life Webber and also offers footage of the actual town of Chatham. This contains comments from Webber's daughter, as well as Chatham residents. The Disc offers two DELETED SCENES which run about 4 minutes. "Brotherhood" (2 minutes) gives a brief profile of the main actors and how they bonded in their water-logged shots. "Two Crews" (2 minutes) is simply an overview of the story, as told by the cast. "What is Your Finest Hour?" (1 minute) has an actual Coast Guard member share a tale of rescue. "The Finest Inspiration: The U.S. Coast Guard" (2 minutes) offers comments from real Coast Guard members.